In this article, I am going to talk about how your responses or reactions affect you when you are attached to a certain way things should be, or a person, time or amount. Have you ever heard someone say, “I’m so attached to him,” or “We’re attached at the hip.”? What does that mean? It suggests a kind of metaphorical, symbiotic relationship where we feel we can’t survive without the other. Not necessarily in the physical sense, but insinuating that without the other we are in some way not whole. This type of thing comes up when we really get attached to a person. It is like a badge of honor because it can help us feel wanted, validated and worthy of love. There is a challenge with this type of attachment. It is actually not founded in the true essence of love and has the potential to cause great suffering. In life, we are all mirrors for each other so when we focus on things and judge people, it is a mirror for us to look at ourselves. It really can be hard for us to look at ourselves and say, “I don’t like that about myself.” Instead, we project the things we may not like about ourselves, things that bug us about ourselves or trigger us onto another person. If that situation keeps showing up in life and it is a pattern, then we need to take a look at the common denominator. We are the common denominator. When we recognize that we are mirroring something, it can help us shift that in ourselves. This in turn will help prevent attracting more of what we don’t like in other people. Responsibility can mean freedom and so can letting go of attachment because we let go of expectations. 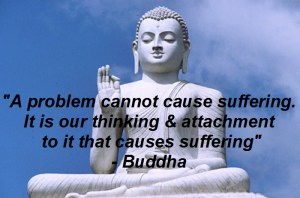 This is important, attachment holds the mistaken belief that our beloved somehow enhances our sense of self. When we are attached to someone in that way, we tend to feel we are less of a person without them. Fear and lack are the driving forces behind attachment, especially when you are talking about another person. In contrast to attachment, love does not restrict or cling, it doesn’t try to change another person. True love springs from the divine source within and nothing can ever be added or taken away. Therefore, love does not seek to possess and capture, it can only display its deepest nature by freely flowing and connection with all other beings. A lot of us have a tendency to go outside of ourselves to say, “Please love me. Please show me I’m loveable. If you prove to me I’m lovable, loving me or being with me, then I’ll feel complete.” The total opposite is true. Once you feel complete within yourself, you bring in your own connection, your own love for yourself. Then what happens is you expand that love with another person. What is different in this situation is that you aren’t asking the other person to love you enough to prove you are loveable. You already love yourself. What is the meaning of detachment? Being detached means that we are rigid, indifferent and cut off from the heart. Non-attachment is open and spacious because we aren’t attached to how life should be and open to the infinite possibilities of life. Energy isn’t wasted by clinging to a job, person or relationship nor do we try to control other people or situations. We live in the flow of life without expectations about how people show up or if they show up. “I’m playing full out and I’m not attached to the outcome.” When we are attached to the outcome, it can limit us in the way we show up because the filters we have come from our expectations. Here is an example of how this works. Let’s say you are at a conference and you meet someone and you are really getting along, so you decide you want to get the most out of the experience. You naturally spend the next few days being really present, fully open because you know it’s a finite time that you are spending with this person. True, you may be sad when you part ways, but there is no expectation that anything will continue past the present moment, so therefore, you don’t suffer. So, let me ask you: How is that reality different from how we engage with people in everyday life? We may think when we meet someone we are connecting with them and begin a relationship. There sometimes is an implied expectation of longevity. We have to realize that life circumstances or the frailty of the human condition along with the changing tide of emotions are things that can make every relationship potentially transient. The potentially transient relationship doesn’t mean that we shouldn’t open our hearts because people could leave. What it does mean is that we get to live fully, passionately and openly, knowing that all we have is this moment, that nothing is permanent. We can set ourselves up for success like this. When you’re in a relationship with someone, knowing it isn’t permanent, we get to live fully and passionately. So, why do we get so upset when our partner leaves the toilet seat up or she checks her phone throughout dinner? We do this because we have expectations and attachments. We fall in love with the image of our significant other as the best or perfect partner which we created in our minds. When that person doesn’t live up to that expectation, we get disappointed and that leads to suffering. In order to end the suffering, we must first accept our partners, friends, and family fully for who they are in each moment, no matter what. So, take a breath because there is no other way to do this; you can’t change the other person. You can suffer. Everyone knows how to do that. You can get out and detach from the situation or the person. There is a caveat, however, if you don’t shift whatever you thought or did to attract the person in the first place, you’re going to keep attracting the same kind of person. You can try to change the other person. We tend to hang on to a relationship because we know that we can change or fix them. At the same time, we believe it’s their fault and it makes us feel better about who we are. We think that will work, so we continue to hang in there, but it doesn’t work. It’s the other person’s choice whether they shift or not; it is not our responsibility for make them shift. The only thing that makes sense is to shift yourself by changing your thought, beliefs, actions word and how you feel about certain things. Learn to accept things the way they are. In the last article, I will go into non-attachment and how that works vs attachment.